Combine shredded zucchini, carrots, hijiki, brown rice and oats in large mixing bowl. Heat first quantity of oil in brazier and sauté minced fresh shiitake and onion for eight to ten minutes, or until soft. Add minced dried (and reconstituted) shiitake caps, garlic and herbs and sauté for an additional five to ten minutes or until starting to turn golden brown. Season lightly, with sea salt and black pepper. Remove from brazier and let cool before adding to mixing bowl (can be done ahead or day before). Meanwhile, combine tahini, tofu, soy sauce, second quantity of olive oil, sea salt and black pepper in high-powered blender and blend until completely smooth. Transfer mixture to mixing bowl. Mix contents of mixing bowl until everything is well combined. Add flour and use gloved hands to knead the mixture until it becomes slightly firm and elastic. Pinch off a small piece of mixture and form into small patty with hands. Mixture should be easily malleable, and hold together well. Add additional flour, if necessary, to properly bind mixture. If too stiff, add a bit of water. Taste and adjust seasonings. Form mixture into four ounce patties and place on oiled sheet pans. Bake at 350°F in a convection oven for twenty minutes. Carefully flip patties and continue baking for an additional twenty to twenty-five minutes, or until just starting to turn golden brown. Grill or pan-fry the burger patty until golden brown, slightly crispy around the edges, and heated through. Place slice of cheese on top of cooked patty and place under broiler to melt. While burger patty is cooking, brush cut sides of buns with olive oil and soy butter and toast on a flat top or under a broiler until golden brown. Reserve. To assemble, dress both sides of toasted bun with condiment of choice. Place pickle slices on bottom bun. Top with burger patty. 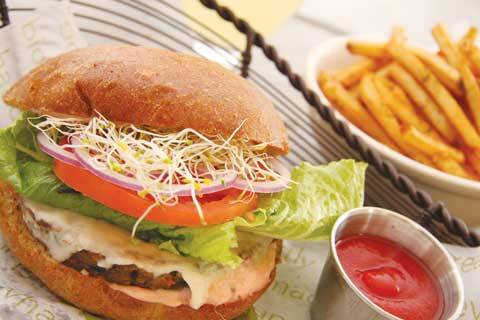 Place lettuce, tomato, red onion and alfalfa sprouts on top of burger. Finish with top bun and serve.